In 1054, observers around the world reported the appearance of a “new star” in the direction of the constellation Taurus. 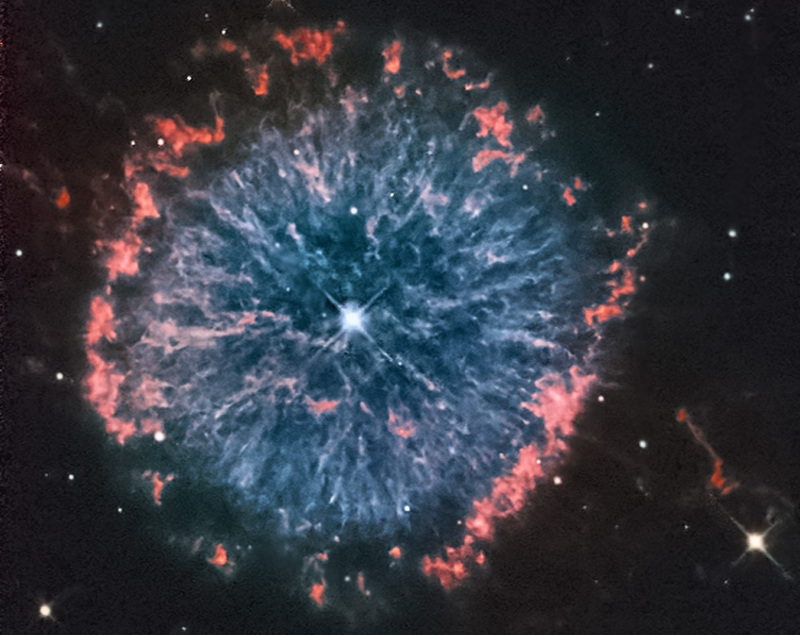 The remnant of that supernova is called the Crab Nebula, and it is powered by a quickly spinning, highly magnetized neutron star called a pulsar. The pulsar was formed when the massive star ran out of its nuclear fuel and collapsed. The combination of rapid rotation and a strong magnetic field in the Crab generates an intense electromagnetic field that creates jets of matter and anti-matter moving away from both the north and south poles of the pulsar and an intense wind flowing out in the equatorial direction. This composite image of the nebula was created with data from the Chandra X-ray Observatory (blue and white), the Hubble Space Telescope (purple), and the Spitzer Space Telescope (pink).